With temperatures expected to reach into the 30s this week, Environment Canada has issued heat warnings for much of southeastern Alberta. 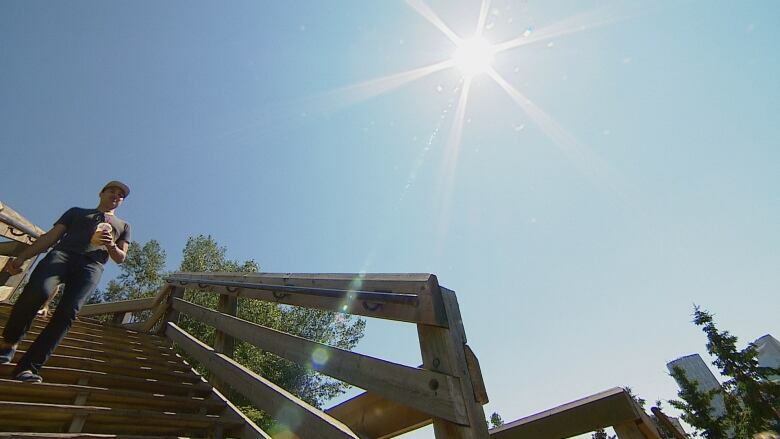 With temperatures expected to reach into the 30s C this week, Environment Canada has issued heat warnings for much of southeastern Alberta, with Calgary added on Monday morning. "An extended period with maximum daily temperatures exceeding 29 C and minimum overnight temperatures of 14 C or above is expected to begin on Monday and last until at least Friday," reads the notice posted to the Environment Canada website. "By midweek, daytime highs are expected to be in the mid 30s C."
Air quality advisories were also put in place for much of the province, the result of smoke from wildfires in B.C. "Individuals may experience symptoms such as increased coughing, throat irritation, headaches or shortness of breath. Children, seniors, and those with cardiovascular or lung disease, such as asthma, are especially at risk," reads an online warning. "People with lung diseases, such as asthma and COPD, can be particularly sensitive to air pollution. They will generally experience more serious health effects at lower levels. Pollution can aggravate their diseases, leading to increased medication use, doctor and emergency room visits, and hospital visits."